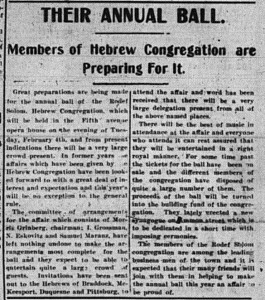 In 1900 the congregation threw a ball to raise money for the new synagogue. 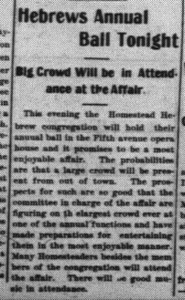 Later articles suggest that this was actually the congregation’s second ball, but the first received no coverage in the paper. The ball given in the Fifth avenue opera house last evening by the Hebrew congregation was well attended and was a success both socially and financially. A large crowd was present from Braddock, Pittsburg, McKeesport and Duquesne, and all had a good time. A feature of the ball was a cake walk. The cake was in turn won by M. Grinberg Dr. John Purman and ’Squire A. J. Kuhn, all of whom gave it back to the congregation. The cake was sold several times, the purchasers being Dr. Purman, Wm. Shephard, Wm. Martin, and S. Wolk, and was finally disposed of in another cake walk, which was won by Joe McMath and Mrs. Mary Bickerton of McKeesport. The congregation’s third annual ball received a good deal of press coverage, disproportionate to such coverage of other events by other religious, let alone minority, groups. A picture emerges of a Jewish community integrated into and respected by the town’s larger community. At a recent meeting of the Homestead Hebrew Congregation Rudoff Shulem, it was decided to hold the annual ball of the congregation in the Fifthe (sic) Avenue Opera House on the evening of Tuesday, February 12, 1901. The past events held by the Rudoff Shulem have been very successful and this one will not be an exception to the general rule. 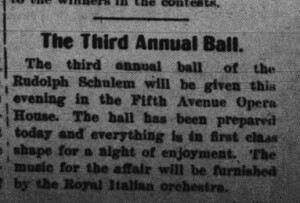 This time they had some competition on the calendar: The ball overlapped with with a free organ recital in Carnegie Music Hall (such recitals, alas, were notoriously unpopular), as well as a reception and euchre of Columbus Council No. 436 Young Men’s Institute in Steenson’s Hall. 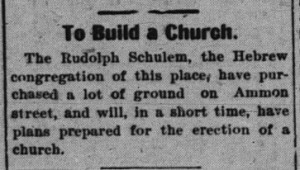 The Rodelph Schulem, the Hebrew congregation of this place, have purchased a lot of ground on Ammon street, and will, in a short time, have plans prepared for the erection of a church. Tomorrow evening the annual ball of the Rudolph Scholem, Hebrew congregation, will be held in the Fifth avenue opera house and the indications are that it will be the most successful yet held by the congregation. The committees appointed some time ago to have charge of the affair have been hard at work and nothing has been left undone to make it one of the best social affairs yet held by the Hebrews. It is expected that a very large crowd will be present from out of town and the local Hebrews will do all in their power to make the occasion a pleasant one to the visitors. Tickets have been selling for some time for the ball and it is said there is a great number disposed of than ever before. This is the third annual ball given by the congregation and the former were very well attended and successful and it is to be expected that thi sone tomorrow evening will be more successful than any yet held. The music for the affair will be furnished by the Royal Italian orchestra which is a guarantee that it will be first class in every respect. The dances given by the Rudolph Schulem are not only attended by Hebrews alone but many of our business people are seen at each one. 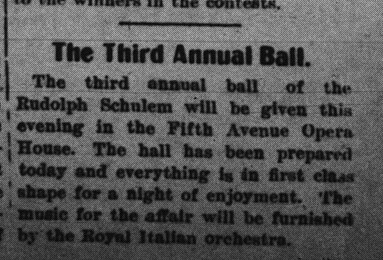 The third annual ball of the Rudolph Schulem will be given this evening in the Fifth Avenue Opera House. The hall has been prepared today and everything is in first class shape for a night of enjoyment. The music for the affair will be furnished by the Royal Italian orchestra. IT WAS A GREAT SUCCESS IN EVERY WAY. 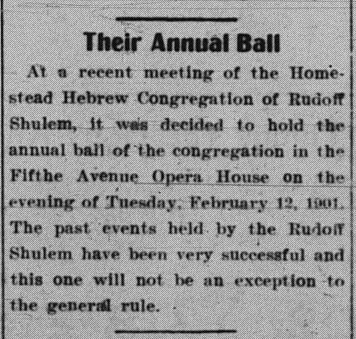 The ball given by the Rudolph Schulem Hebrew congregation of this place, in the Opera House last night, eclipsed, in point of attendance and enjoyment any occasion of this kind that ever took place in the town. There were nearly 300 people in attendance, the crowd being a representative one, being made up of some of the best people of the town of all denominations and creeds. The affair was well managed throughout and everything passed off in the most satisfactory manner. Joseph Lasdusky acted as chairman and Morris Frankle as floor manager and to these two gentlemen belong a greater part of the credit for the success of the affair, although all the members of the congregation worked hard for the success of the affair. Those on the arrangement committee for S. Moranze, I. Goldstein and Adolph Hipps, all of whom did their share towards making the affair a success, as did also I.S. Grossman, who acted in the capacity of head waiter. Herman Horft had general supervision over the refreshments and conducted his department well, he having for his assistants the members of the ladies’ aid society, to whom the congregation are indebted for the provisions. The ladies had the refreshment stands nicely arranged and presided over them in a manner that won for them much praise, the good things they served being one of the features of the ball. Good music was in attendance and dancing was indulged in without interruption until 3 a.m. During the evening some of the friends of the congregation showed their generosity by contributing liberally to the cause, among them was Wm. Martin, who won the cake walk, who gave the cake back to the congregation and bought it at a fancy figure at auction, then presented it to the committee a second time. Isadore Klein was another who displayed his generosity, he purchased a cake which he gave back to the committee to sell over again, along with a handsome headrest, donated by Mrs. Shermer, of Braddock. Mrs. Weisberg, of Braddock donated a fine silk umbrella, which was won by Mrs. Celia Greinberg. Mrs. Frankle and Mrs. Weisberg conducted the raffle and realized a nice little sum for the congregation. Taking the ball as a whole it was one that reflects with great credit upon the congregation which is striving to raise a sufficient sum to erect a synagogue, and they deserve the success with which their efforts met last night. They have already won a lot on Ammon street adjoining the Second ward school and the sum raised last night will be sufficient to start work on the synagogue which will be completed as soon as possible. The Hebrews of Homestead, as a rule are a class of people who do credit to the town and everyone will be pleased to see them with a place of their own. 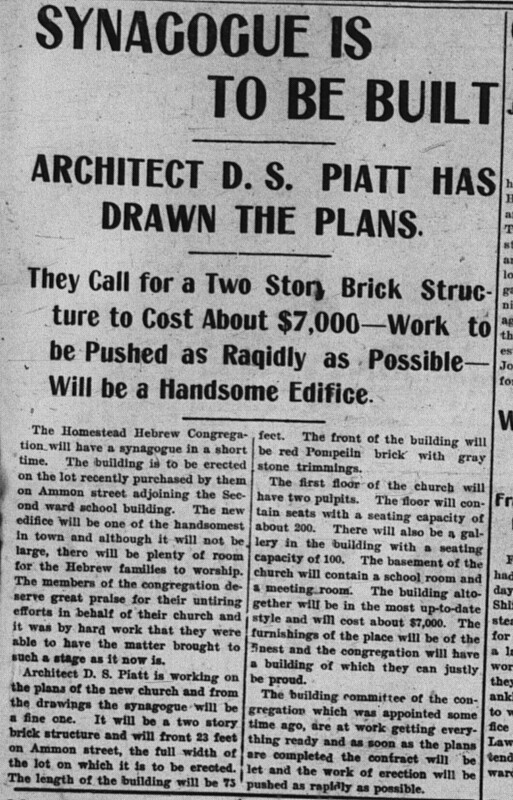 They Call for a Two Story Brick Structure to Cost About $7,000–Work to be Pushed as Rapidly as Possible–Will be a Handsome Edifice. The Homestead Hebrew Congregation will have a synagogue in a short time. The building is to be erected on Ammon street adjoining the Second ward school building. The new edifice will be one of the handsomest in town and although it will not be large, there will be plenty of room for the Hebrew families to worship. The members of the congregation deserve great praise for their untiring efforts in behalf of their church and it was by hard work that they were able to have the matter brought to such a stage as it now is. Architect D.S. 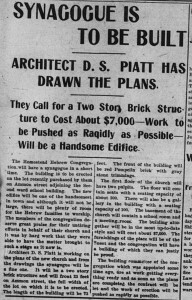 Piatt is working on the plans of the new church and from the drawing the synagogue will be a fine one. it will be a two story brick structure and will front 23 feet on Ammon street, the full width of the lot on which it is to be erected. The length of the building will be 73 feet. The front of the building will be red Pompeiin brick with gray stone trimmings. The first floor of the church will have two pulpits. The floor will contain seats with a seating capacity of about 200. There will also be a gallery in the building with a seating capacity of 100. The basement of the church will contain a school room and a meeting room. The building altogether will be in the most up-to-date style and will cost about $7,000. The furnishings of the place will be of the finest and the congregation will have a building of which they can justly be proud. The building committee of the congregation which was appointed some time ago, are at work getting everything ready and as soon as the plans are completed the contract will be let and the work of erection will be pushed as rapidly as possible. 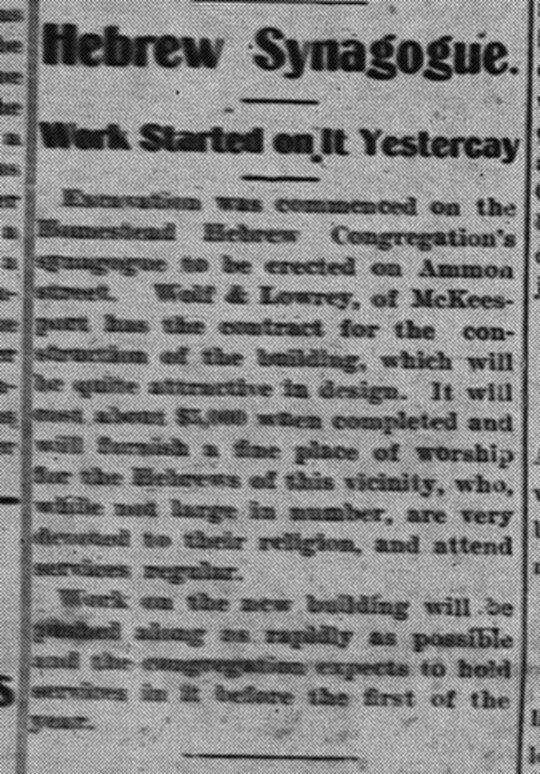 Excavation was commenced on the Homestead Hebrew Congregation’s synagogue to be erected on Ammon street. Wolf & Lowrey, of McKeesport has the contract for the construction of the building, which will be quite attractive in design. It will cost about $3,000 when completed and will furnish a fine place of worship for the Hebrews of this vicinity, who, while not large in number, are very devoted to their religion, and attend services regular. Work on the new building will be pushed along as rapidly as possible and the congregation expected to hold services in it before the first of the year. Shame about the timing — the evening was the hottest night in the past five years. The start of this job couldn’t have been fun for the workers. You can view the contract with the builder here! Note that it names the architect as “Wilson + Lindemans,” not D.S. Piatt, and the building is to be a frame building, not a brick one. A later article indicates only 80 seats in the shul, not the 200 mentioned earlier. Given the change in cost between this article and the previous one, it seems that perhaps the synagogue had to scale back its plans? What happened next? Well, the cornerstone laying! 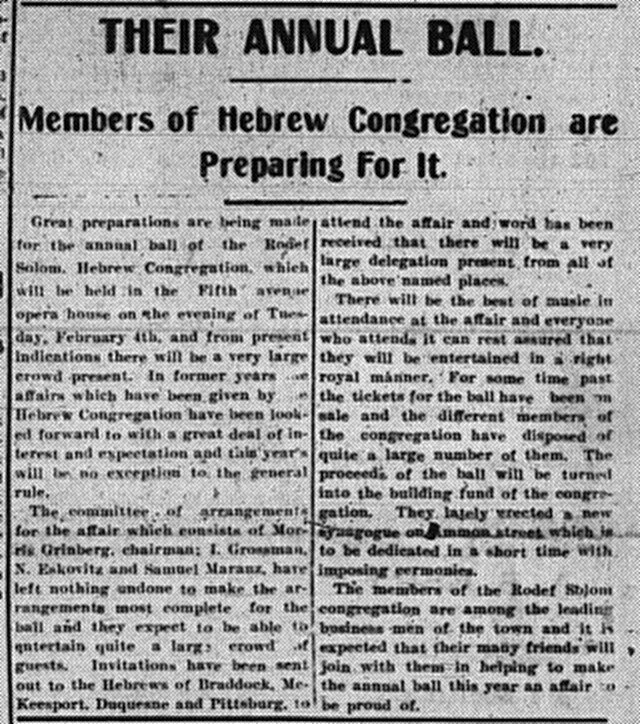 Apparently these balls produced real results for the congregation — the last article notes that as a result the synagogue was dedicated debt-free! Members of Hebrew Congregation are Preparing For It. 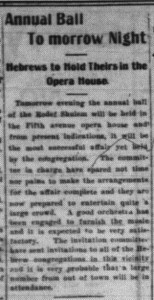 Great preparations are being made for the annual ball of the Rodef Solom (sic) Hebrew Congregation, which will be held in the Fifth avenue opera house on the evening of Tuesday, February 4th, and from present indications there will be a very large crowd present. In formers years the affairs which have been given by the Hebrew Congregation have been looked forward to with a great deal of interest and expectation and this year’s will be no exception to the general rule. The committee of arrangements for the affair which consists of Morris Grinberg, chairman; I. Grossman, N. Eskovitz and Samuel Moranz, have left nothing undone to make the arrangements most complete for the ball and they expect to be able to entertain quite a large crowd of guests. Invitations have been sent out to the Hebrews of Braddock, McKeesport, Duquesne at Pittsburg, to attend the affair and word has been received that there will be a very large delegation present from all of the above named placed. There will be the best of music in attendance at the affair and everyone who attends it can rest assured that they will be entertained in a right royal manner. For some time past the tickets for the ball have been on sale and the different members of the congregation have disposed of quite a large number of them. The proceeds of the ball will be turned into the building fund of the congregation. 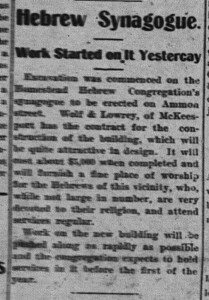 They lately erected a new synagogue on Ammon street which is to be dedicated in a short time with imposing ceremonies. The members of the Rodef Solom congregation are among the leading business men of the town and it is expected that their many friends will join with them in helping to make the annual ball this year an affair to be proud of. Hebrew to Hold Theirs in the Opera House. 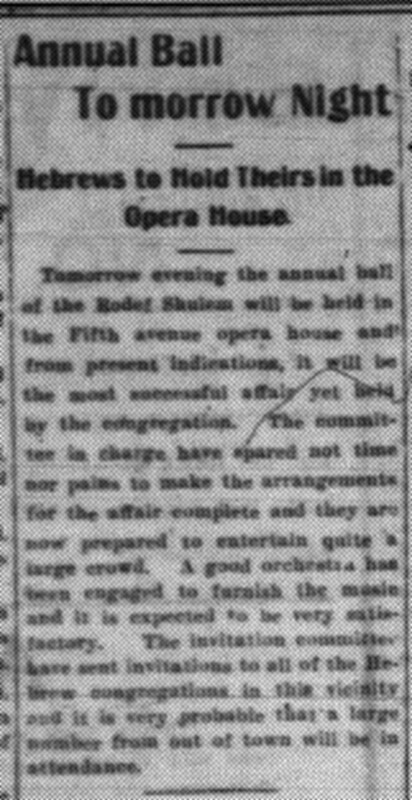 Tomorrow evening the annual ball of the Rodef Shulem will be held in the Fifth avenue opera house and from present indications, it will be the most successful affair yet held by the congregation. The committee in charge have spared not time nor pains to make the arrangements for the affair complete and they are now prepared to entertain quite a large crowd. A good orchestra has been engaged to furnish the music and it is expected to be very satisfactory. The invitation committee have sent invitations to all of the Hebrew congregations in this vicinity and it is very probable that a large number from out of town will be in attendance. Big Crowd Will be in Attendance at the Affair. This evening the Homestead Hebrew congregation will hold their annual ball in the Fifth avenue opera house and it promises to be a most enjoyable affair. The probabilities are that a large crowd will be present from out of town. The prospects from such are so good that the committee in charge of the affair are figuring on the largest crowd ever at one of the annual functions and have made preparations for entertaining them in the most enjoyable manner. 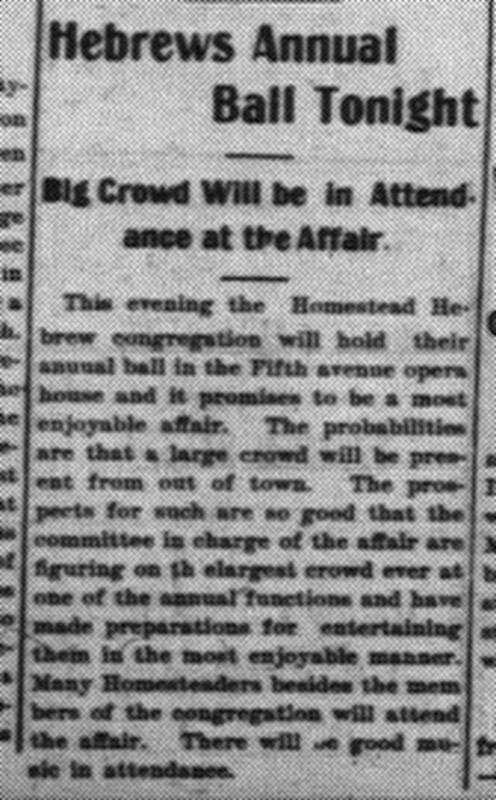 Many Homesteaders besides the members of the congregation will attend the affair. There will be good music in attendance. Much Money Realized for Their New Church. The annual ball of the Homestead Hebrew congregation, which took place in the Fifth avenue opera house last evening was attended by over 100 couples and was one of the best conducted affairs of the kind ever held in this place. Both the old and young of the Hebrew race were out in all force, along with some of the leading citizens of other nationalities, and all united in having a good time. Dancing commenced shortly after 8 oclock and continued until 3 this morning, and was interspersed with cake walks and other forms of amusement which help to keep things livened up all through. The affair was in charge of the male members of the congregation who were ably assisted by the ladies. The men looked after the dancing and serving of refreshments, while the ladies helped to swell the receipts by conducting guessing contests, raffles, etc. Mrs. Hipps won the ladies’ prize in the guessing contest and P.O. Boyd won the handsome umbrella raffled off. The cake walk was another feature which created a good deal of interest [illegible] and Mrs. Joseph Lasdusky finally off the cake. Morris Grinberg was chairman of the general arrangement committee and Moris Frankle was chairman of the [illegible] committee and their hand work and ability shown as managers, had much to do with the success of the affair. Joseph Lasdusky also helped to keep things moving and saw to it that everyone had a good time and was instrumental in helping to swell the receipt. Mr. Grossman, B. Hepps, H. Horck, M Cohn and Benj. 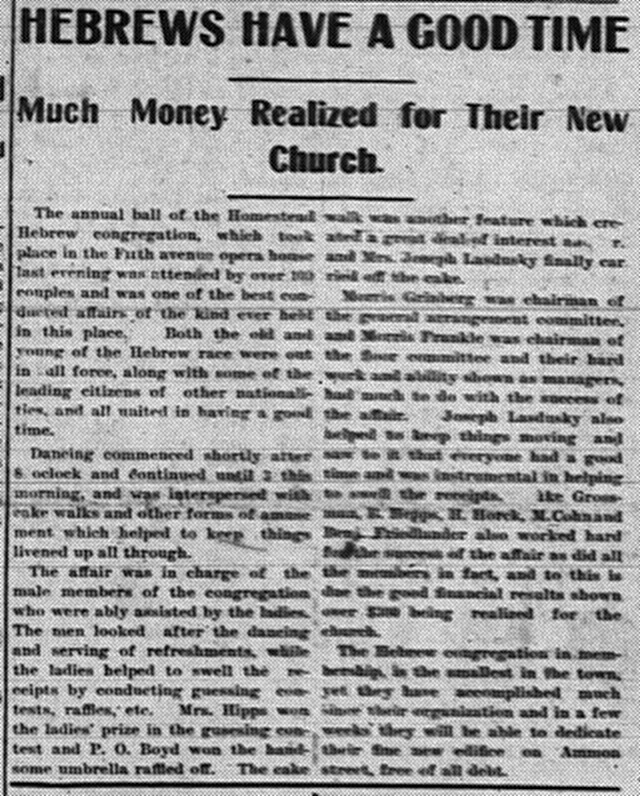 Friedlander also worked hard for the success of the affair as did all the members in fact, and to this is due the good financial results shown over $300 being realized for the church. 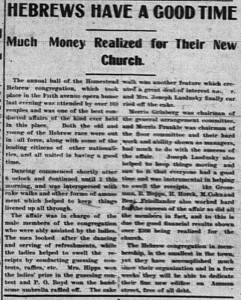 The Hebrew congregation in membership is the smallest in the town, yet they have accomplished much since their organization and in a few weeks they will be able to dedicate their fine new edifice on Ammon street, free of all debt. Two months later, at last, the new synagogue was dedicated!